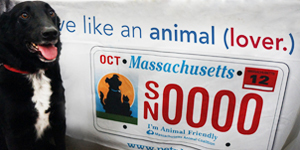 The Massachusetts Animal Coalition’s “I’m Animal Friendly” license plate tells your community that you care about animals! 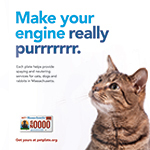 By purchasing this license plate, you will be contributing to a program that supports statewide spay/neuter efforts for cats, dogs, and rabbits. How Do I Get The Plate? Buying a car at a Massachusetts dealership? Ask at the dealership if they can get the “I’m Animal Friendly” plate! 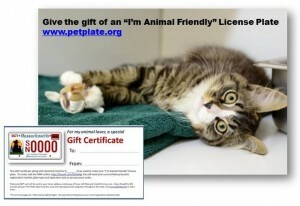 What Are License Plate Spay/Neuter Grants? Help animals in your community by spreading the word about the “I’m Animal Friendly” license plate! Spay/neuter is one of the most humane ways to decrease the number of homeless animals and the need for affordable spay/neuter is growing! Spay and neuter surgery is expensive, especially for non-profit organizations working hard to find animals homes. Can I Give a Plate as a Gift! Note: Gift recipients must order the plate themselves because they need to have their license and registration handy to complete the application. The total is $100.00 (registration renewal plus the $40 special plate fee). Thank you for supporting animals! Read more about our 2018 “Drive Like an Animal(Lover)” campaign to drive plate sales and help more animals in Massachusetts!